Two Reuters journalists reported missing in Myanmar since Tuesday are in police custody, the government says. It has not confirmed why Wa Lone and Kyaw Soe Oo were arrested in Yangon, the international news agency said. "We are urgently seeking more information about the circumstances of their arrest and their current situation," Reuters said. Myanmar has seen increasing curbs on press freedom, especially on issues around the powerful military. Local reports say they have been held under the Official Secrets Act, and a lawyer involved in the case told the BBC that the pair could face 14 years in prison. According to local paper Frontier Myanmar, the two were arrested on the outskirts of Yangon, the commercial capital, after being found in possession of military reports and a map of a location in northern Rakhine state. Reuters said a spokesman had confirmed that they were arrested late on Tuesday. Myanmar's ministry of information said two police officers - named as deputy Moe Yan Naing and Sgt Khin Maung Lin - were also arrested under the official secrets act and police disciplinary act. The US embassy in Myanmar issued a statement saying it was "deeply concerned by the highly irregular arrests" of the journalists. It said the pair were arrested "after they were invited to meet with police officials in Yangon". "For a democracy to succeed, journalists need to be able to do their jobs freely. 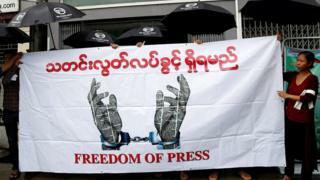 We urge the government to explain these arrests and allow immediate access to the journalists," it said. Rakhine has been the site of months of conflict, with government troops in the Buddhist-majority country accused of targeting the Muslim Rohingya population. Violence broke out on 25 August when Rohingya militants launched attacks on police posts in the state, killing 12 security personnel. More than 600,000 Rohingya have since fled the violence to neighbouring Bangladesh and Myanmar (also called Burma) has been widely condemned by the international community for its brutal crackdown. Journalists' access to the affected areas has been tightly controlled by the military. In November, two foreign journalists were arrested while local journalists describe "a climate of fear" returning to the country's independent media.